Well folks, I'm back and recovered from GaryCon and wow was it quite different than GenCon Indy. Different as in going back in time by 20 or 30 years. 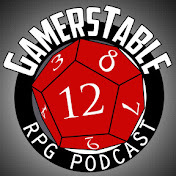 Here's a rundown on the weekend that I shared with my long time gaming best friend Jayson. Wisconsin and Lake Geneva is gorgeous. 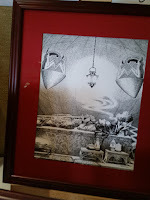 I'm from southern Illinois so geographically Wisconsin isn't much different, but the city of Lake Geneva and the resort that GaryCon is held at is simply wonderful. I could do a whole blog just on the peripheral sights to see. Needless to say, if you go to GaryCon in the future, venture out to the Lake, explore, it's worth it. Good friends, amazing artists. 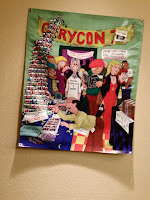 We had planned zero events for GaryCon and truly had zero idea what to expect. In two days though, we filled our entire schedule with invites to gaming, a panel and meals. We felt really appreciated being among a smaller, more intimate crowd. That said I definitely was there to meet some fellas from the Greyhawk community. My good friend and patron from the Canonfire! community, Kraftwerk was first to greet us (though our hockey rivalry would soon strain that relationship) and invite us to his game. Fellow Castle Greyhawk comic scribe, Scott Casper was there as well and we hung out for the game and then for a good part of the day in the Exhibition Hall and where we got to meet the legendary artist behind the World of Greyhawk map, Darlene herself. 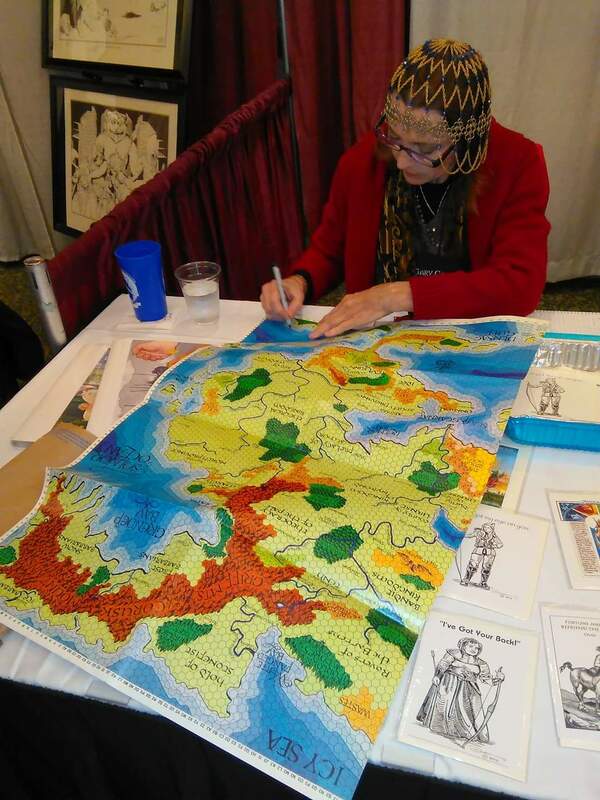 I don't need to tell any of you how great it was to meet her and have her sign one of my Greyhawk maps. It was even greater to spend the rest of the evening with her and Kraftwerk afterward! 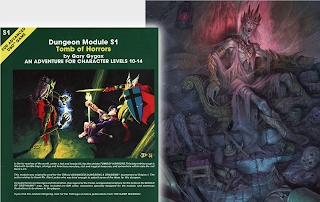 Not to be outdone, on Saturday we were invited by one of my favorite community friends, Allan Grohe of Blackblade Publishing to play in one of his "gygaxian" Castle Greyhawk dungeon crawls. More on the games in a bit. One thing to note: when you walk into Gary Con there is a whole roster of gaming veterans and VIPs at every turn who freely mingle with the crowd. You can't get that as easily at a huge convention like GenCon. 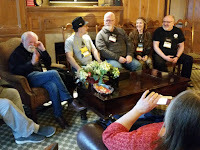 We sat in on a TSR panel which included Darlene and the likes of Larry Elmore, Bill Willingham, Jeff Easley, Jeff Dee, Steve Sullivan, Tom Wham, Diesel and Jeff Butler. 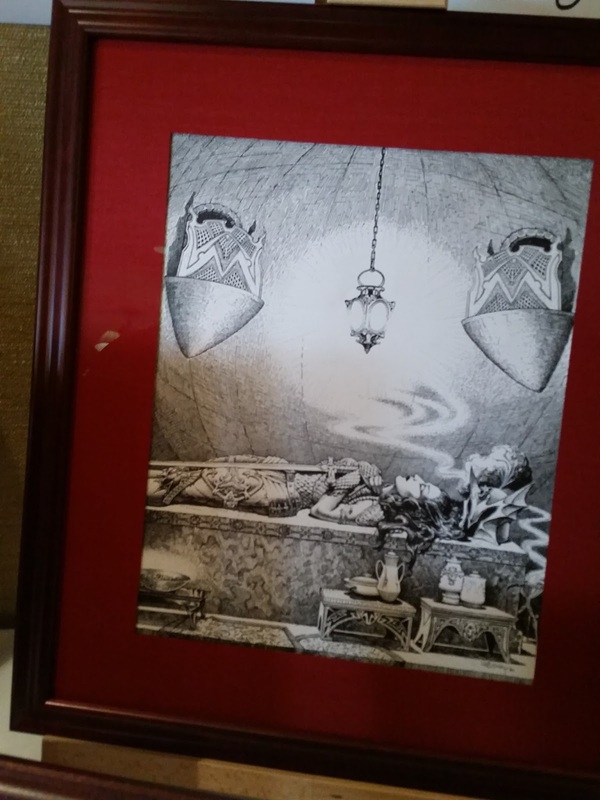 The stories they told about working in the old offices at Lake Geneva, how they got hired, bagging on artists not present or honoring those passed away, was the highlight of the con. It was a different time for artists back then, they really taught each other a lot. Coming out of that I really felt like I was born in the wrong era. Speaking of art. On the second floor in the historical gaming room (how this all got started), was an original art display of the likes you'll not see anywhere else. 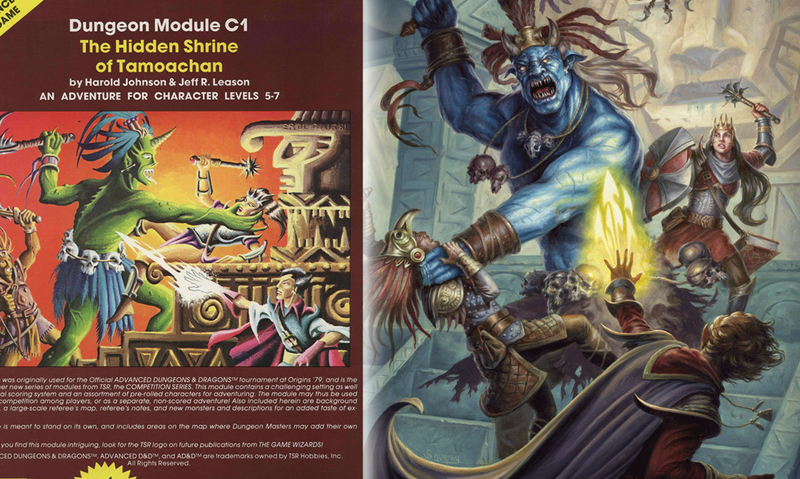 Among the best and most iconic pieces there was the paladin in hell illustration by Dave Sutherland from the 1E Players Handbook. Crazy good linework. This picture inspired me to run many encounters with demons of the lower planes. 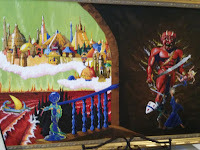 Then there is Jeff Easley's sleeping vampire Drelzna from the Lost Caverns of Tsojcanth. 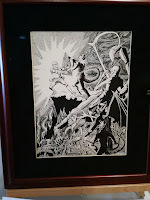 Easley is usually known for his amazing full color cover paintings, but even his B&W interior art is inspiring. I had the privilege of seeing a new painting Mr. Easley did for the con, which I'm hoping you will all get to see in the coming year. One more to show, is the full wrap-around painting for the cover of the 1E Dungeon Masters Guide also by Dave Sutherland. 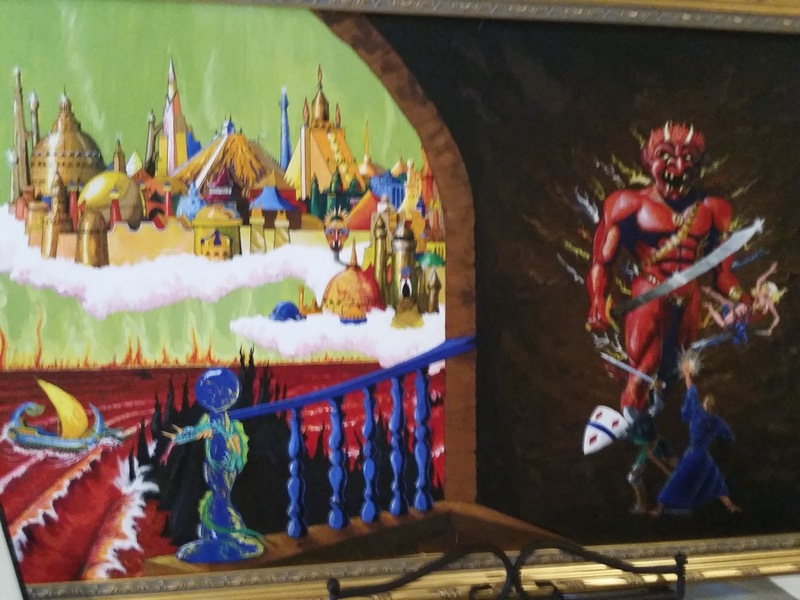 He wasn't the best artist of that era (my faves are Erol Otus and Dave Trampier) but this painting is among my favorite D&D works of art, so to see it in person was an honor if not eye opening on how art was done back in the day. Kill Markessa. Kraftwerk's mission was supposed to be simple. A powerful benefactor hires a fellowship of heroes to go into a lair and slay the infamous Slaver and vile surgeon Markessa. In two hours real time. A couple illusions and one orc room later, a chaotic melee broke out including misshapen trolls and guard dogs. We found and woke a Markessa duplicate only adding to the confusion. That we failed and the real Markessa got away is no surprise. There is always next time for Die Markessa, Die! I guess. 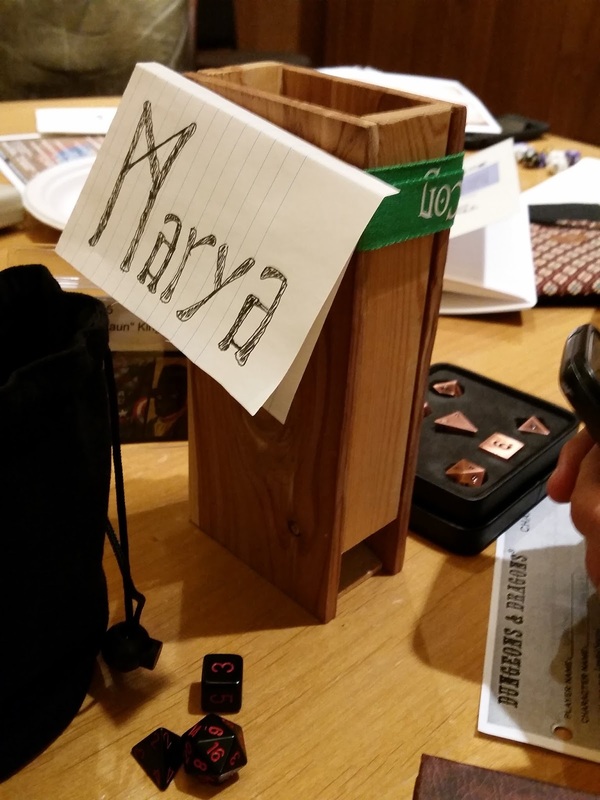 What made this adventure extra special was our VIP guest, Luke Gygax! 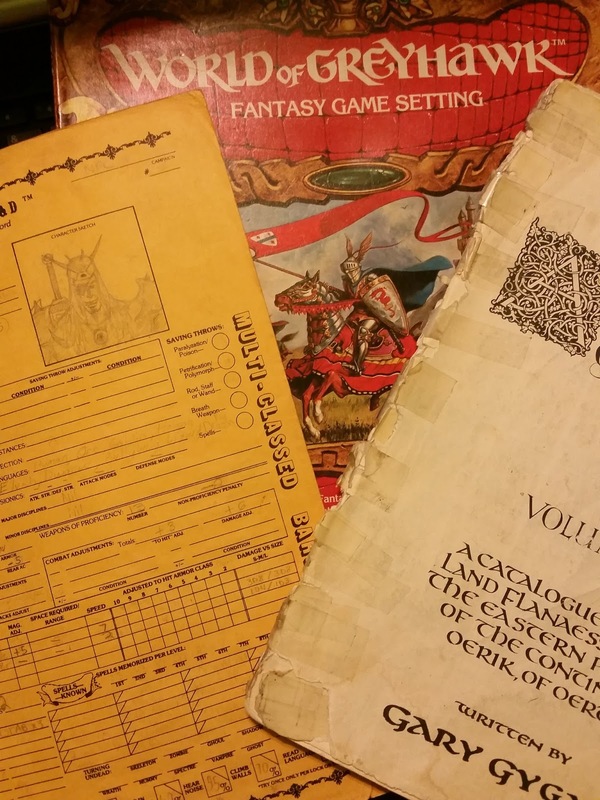 Now being able to say I gamed with a Gygax is definitely a feather in my cap for the rest of my life. Upon Thy Head a Crown. I hope I got this title right. Our last game was ran by Kraftwerk again, involved several deceased, chosen proxies (yes the female dwarf, Marya was there again) of a variety of deities being sent into a series of rooms to test who is most worthy to gain the object at the end, with the prize being you are resurrected, thus lifting the station of their patron deity. It was a game of the gods. Each room had an elemental theme and required more than combat to cross, indeed it took a marvelous amount of thinking to get by the wind and water and icy environments when we all started with nothing but clothes and a signature weapon. Literally everything we came across or took from a slain foe was used in some way to get past the traps and hazards. It was fun and the end wrap up was nicely done leaving everyone happy and applauding our DM. That's the run of it all. I could go into my haul or other stuff but we'll leave that to your imagination. I am so glad to have met a host of new gamers, many of which are Greyhawk fans, and many which I got to hang around multiple times. I hope to see you guys online, just drop me a line if you read this! 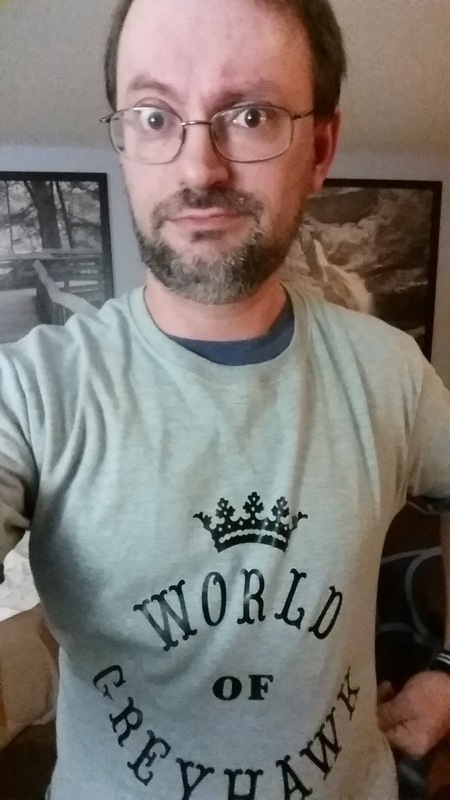 Maybe I'll see you at another GaryCon soon! First, let's mention the outliers here. Coming in tied at last place with 3% I offered Krakenheim, capital of the Frost Barbarians for some nordic variety. Setting canon is mum on whether these viking analogs are big drinkers, but up in the Cold North they have to be drinking something other than walrus blood right? Also coming in with 3% of the vote is Gryrax. I chose the capital of the Principality of Ulek because it is nominally ruled by dwarves. Dwarves are historically famous for their brews and being a port city, I figured Gryrax would also be a good exporter of booze. I guess it was just me. Speaking of dwarves, let's skip to the winner of this poll, Irongate at 44% of the vote. Irongate has alot going for it in brewing. 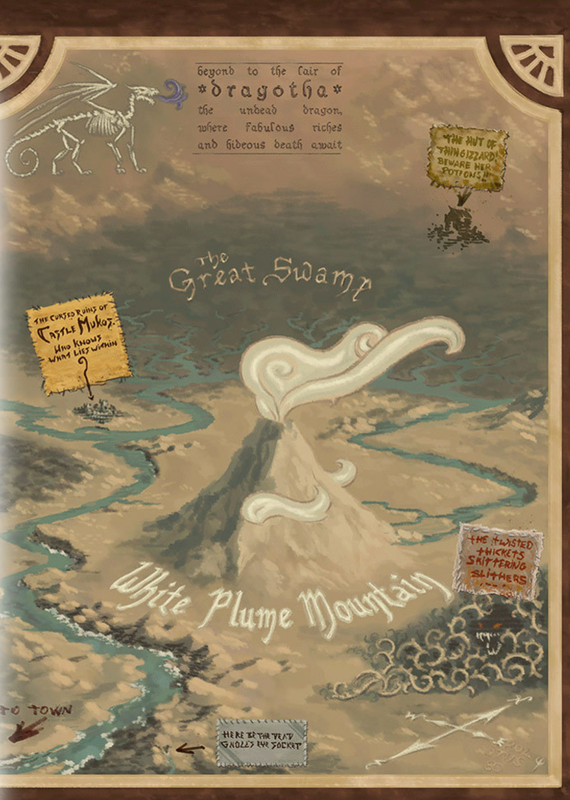 It has a strong dwarven population (not to mention other small folk) being close to the Iron Hills. It too is a huge port city so they have the capacity to brew enough to export. Also. Irongate is a fortress that has withstood more than one siege in its time, so having good stores of alcohol is essential for morale and possibly combat. Lastly, Irongate was once featured in an article for Dragon #351. The city is a home to the plane hopping World Serpent Inn. That means Irongate has to have the Flanaess' most diverse collection of brews. Tied for second is the Perrenland capital of Schwartzenbruin at 20%. I chose this place obviously for the Germanic analog. Perrenland is a mountainous home to proud mercenaries and adventurous demihumans, so it immediately conjures up images of festive halls in my mind. Also tied for second is the Free City of Greyhawk. This multi-cultural city was a no-brainer for the poll since there is a plethora of brew houses and bars in canon. 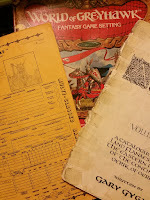 One only needs to reference the City of Greyhawk boxed set to find info on the Guild of Ostlers and Brewers or randomly roll up a new brewery in Old City or Artisans Quarter. To finish up, coming in with a surprising 6% of the vote is the largest Bandit Kingdom city, Rookroost. Much like Irongate, this city is a fortress and with it's own raucous bandit population, so certainly it's bound to have a good brews to keep them happy. Of course it's also plausible they steal all their brews from nearby Duchy of Tenh, Theocracy of the Pale or Shield Lands. Who knows? I'd have to ask some former Living Greyhawk folks to be certain. I checked the 2E adventure Fate of Istus, which has the most info on Rookroost and found a wealth of city material but no supporting brew facts. Darn! One last tidbit. For those wanting some old school homebrew brew ideas for their Greyhawk campaign (and way back), go back in time to the Codex of Greyhawk website, archived over at the Wayback Machine! Enjoy! 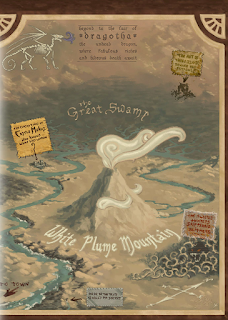 The colorized map of White Plume Mountain is simply fantastic. I don't know if you've ever downloaded Dragon+ before, but at first I wasn't keen on yet another digital Dragon, yet lately their content is starting to get more interesting; albeit they are glorified advertisements. Next issue they promise more previews of Yawning Portal and a report on Garycon, which I will be attending. Can't wait!